I had the honor of meeting Tim Gillingham of Gold Tip Archery at the ATA Show in Indianapolis, Indiana and instantly was blown away by his passion for and knowledge of archery. It’s rare that I actually shut my trap and listen at full attention when someone is talking about archery because, quite frankly, not too many people are that knowledgeable on the subject; not with Tim. When I met him, we shook hands, we talked, and I tried to absorb every word he said. 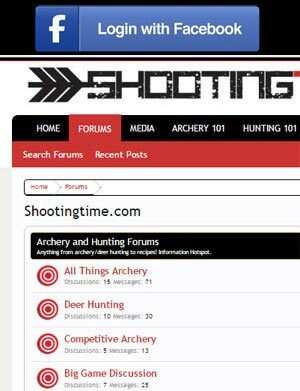 Tim has done us the honor with providing us a few articles that we will publish in the near future so lets take a quick look at him in this Shootingtime.com Shooter Spotlight. with LP Light kit. Black dot for Fita. Stabilizer: 30” Beestinger Premier Plus with 10-12oz in the front and 20” Vbar with 16-20 oz or V-bars with the weight split. I shoot a command style release, meaning it is not a surprise when I shoot the shot. I feel like it gives me more control in various conditions and fits how I aim better. Although mentally it is not for everyone, I personally believe a surprise release is not either. We all have different aiming abilities and the subconscious can be harnessed no matter how we fire the release. I do, however, work with the Hamskea Break-Through release to eliminate anticipation and create a strong dynamic shot. I try to focus on where I want the arrow to go and try to train my subconscious to keep the follow through happening both physically and mentally. That keeps the mind from thinking about the release. It is very important to mentally pre-program each shot before you do it. This makes sure you are thinking positive and your subconscious is clear on what you want it to do. 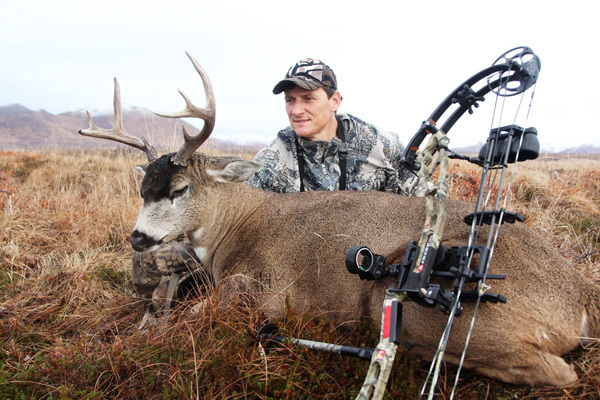 Use your stabilizers to balance your hunting bow and add mass weight to your setup. I use a short stabilizer with an offset bracket to get the weight to left side of the bow to counter act the pulling weight of the quiver and the sight on the side of the bow. Also look for how the bow reacts when you fire. If the top limb is kicking back it will cause high arrows so make sure you add weight to the end of the stabilizer to counteract this. If I am hunting in a tree stand and not hiking a lot then I will use two stabilizers together with a front and a back using an adjustable side bracket. It will help you to have a heavier setup at the moment of truth when that big buck is headed your way. I try to keep the mass weight of my setup as heavy as I can handle and then just experiment with the stabilizer system to see what makes me hold the best. The beauty of the Bee Stinger system is that it is very versatile and allows for easy experimentation. I change the weighting on my stabilizer regularly depending on how I feel that day. I run a sidebar with around 20 oz for about everything but field where I shoot a v-bar setup. When I am shooting up and downhill as the long side bar close to the bow can get in the way when shooting a steep angled shot. I also use a 10 degree down angle mount as it allows me to rotate the mount to get the weight on the end of the stabilizer directly in front of the bow. Buy the best optics you can afford and trust your rangefinder. Make sure your sight is level and learn how to shoot at every angle and distance with precision accuracy. I also use the cut shot charts on the Archers Advantage program to give me the exact cut I need for up and downhill shots. The skills I have learned in field archery have really paid off in the field. My last 3 mule deer have required extreme shots with 12, 15, 15 yard cuts off of the rangefinder reading, all resulting in dead center kills. Today’s new angle compensating rangefinders help very much but become familiar with them and if you are shooting extreme distances and extreme angles, be sure to check the rangefinder against a cut chart that is dead accurate. I enjoy all disciplines of archery with my favorites being 3-D, marked distance FITA, Field Archery and Bowhunting. I also enjoy fishing and a little golf here and there. 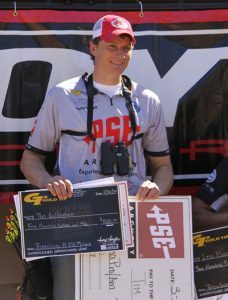 I want to thank all of my sponsors and my employer, Gold Tip LLC. for the opportunity to do what I am good at and have a passion for. It truly is, a childhood dream come true. 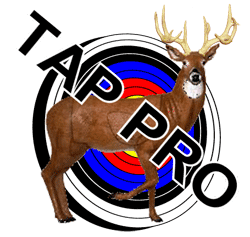 I have been shooting archery for 30yrs and have had my share of trials and tribulations. It is great to see the perseverance finally paying off. I am best known for my style of shooting a release aid on command It has even garnered the nickname “the Hammer” that I receive some chiding about. I believe it is what makes me a very versatile shooter in almost any format of archery. I spend a lot of my practice time working on new equipment and judging yardage for 3-d events as the biggest amount of prize money to be won is in that format. 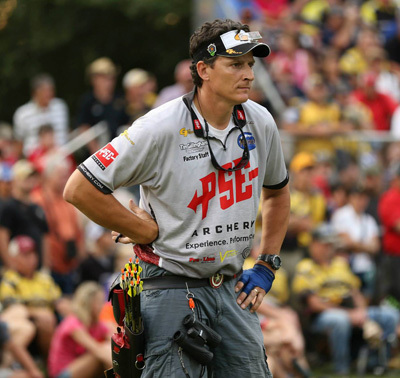 I prefer marked distance as I believe it puts all archers on a level playing field and rewards the better archer rather than the better yardage judger, although I do prefer the scoring system that ASA uses that incorporates risk and reward into the tournament. One of my long term goals is to gain the credibility to facilitate the growth and organization of archery into an exciting promotable format that is enjoyed as a pastime for millions in the US and abroad. My short term goals are to do the work I know I need to do to win enough tournaments to give me the credibility to be able to promote my sponsors and my employer as effectively as I can. I try not putting any more emphasis on one tournament over another, rather, I try to concentrate on each individual arrow and let what ever happens, happen. I strive to be a smart, calculated competitor that is well prepared.